Freelance Lady: Monster Funder Review: Is it worth it? Monster Funder Review: Is it worth it? Monster Funder is a crowdfunding promoter. In other words, if you're trying to get more exposure on a fundraising campaign (such as a GoFundMe or KickStarter), Monster Funder will promote your campaign—in exchange for a fee. What does Monster Funder do? "With such a dedicated and active following, we use our platform to help many in need, people just like you!" You need to gain a large amount of donations and quickly. 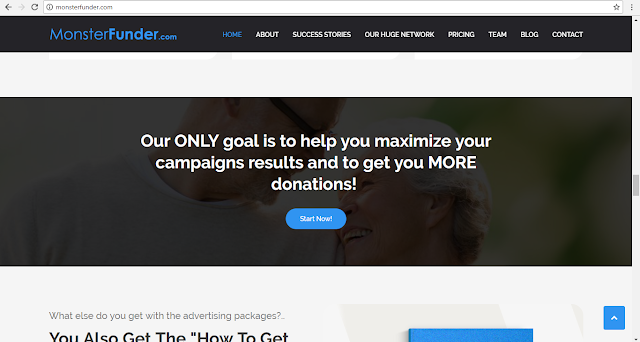 Your fundraising campaign could benefit from very wide exposure. Someone you know is in desperate need of a quick injection of funding. I started a campaign at the end of April to help cover my dental work. I thought long and hard about whether or not I should invest the funds into my campaign or if I should pay Monster Funder to —hopefully—increase my exposure, and in turn, increase my donations. After reading through Monster Funder's websites and checking out some of their "Success Stories," I decided that I was going to make the investment. It sounded like a good idea. I was hoping to, at the very least, break even. It sounds like a good deal, especially if you get a return on your investment. Unfortunately, I did not get a return. That in itself wasn't a big issue for me. The big issue, however, was the promotion techniques (or lack thereof) offered by Monster Funder. The tweet above is literally the same exact tweet that they used every time, on all six pages, for all 60 Tweets. There was no changing the wording, no adding relevant hashtags. Nothing. What you see above is what you get. For a company that claims, "Our ONLY goal is to help you maximize your campaign results and to get you MORE donations!" I was highly disappointed in the lack of promotional techniques by this promotion company. Seriously. Even a brief glance at my campaign would have shown that it was for dental work. And this isn't an isolated incident. If you go to their Twitter page and take a look at the campaigns they're tweeting, they do not include relevant hashtags in a single one (as of 5/27/2018). I think that was one of my biggest issues with Monster Funder. It's almost as if they didn't even try to make the tweets worth reading. I did not receive donations as a direct result of Monster Funder's promotion. That's all the engagement that I received on SIXTY TWEETS. Keep in mind that these stats do not include my own retweeting and liking of the tweets. I decided to do a little promotion of my own. I designed a Twitter flyer and promoted it across Twitter with relevant hashtags. On this single Twitter post, I received 7 retweets, 11 likes, and two comments. I had over 12,000 views with 36 link clicks! I had a better engagement rate on a single Tweet than I did with all of Monster Funder's individual Tweets, even though I have less than 2k followers versus their 1.3 million combined followers. It should be noted that I did receive a $3 donation that was listed as anonymous. I later found out that it was from the child of a friend of mine. She wanted to donate the money she had leftover from her allowance, so her mother donated it for her. It was a sweet gesture, and one for which I am thankful, but unfortunately, was not a result of Monster Funder's promotion efforts. Do you recommend Monster Funder? No, I do not recommend Monster Funder. I feel that my money would have been better spent using Twitter or Facebook's promotional tools. None of the hashtags that were used were going to get the exposure that it could have gotten (with relevant hashtags). Their tweets felt lazy and robotic, almost as though someone scheduled all of them, threw a hashtag in front of a random word, and clicked "Submit." There were also numerous incidences when Monster Funder could have utilized relevant, trending hashtags to get more exposure on a campaign, but they missed those opportunities too (one example of a trending hashtag that would be relevant to most campaigns was #GivingTuesday). In Monster Funder's defense, they did make good on their word. My campaign was tweeted 60 times on six of their pages. However, they really do talk up their services quite a bit for something that turned out to be rather mediocre and ineffective. Thanks for sharing this. I had been wondering if they were worth it, and now I know! I almost went for the $20 package & thought “maybe I should check out some reviews”. I’m glad I did! Thank you for your tips.